Search and adopt a Dogue de Bordeaux near you. 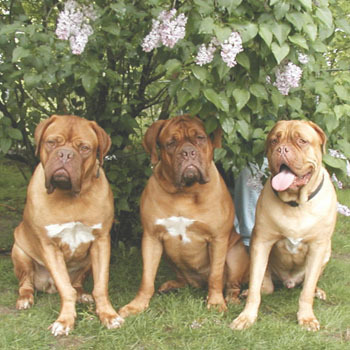 The Dogue de Bordeaux is one of the most ancient French breeds. He is a very powerful dog, with a very muscular body yet retaining a harmonious general outline. Built rather close to the ground, the distance from the deepest point of the chest to the ground is slightly less than the depth of the chest. A massive head with proper proportions and features is an important characteristic of the breed. His serious expression, stocky and athletic build, and self assurance make him very imposing.